1Internal Medicine Department, Hospital of Laredo, Laredo, Spain; 2Infectious Diseases Unit, University Hospital Marqués de Valdecilla, University of Cantabria, Santander, Spain. Copyright © 2013 Miguel F. Carrascosa et al. This is an open access article distributed under the Creative Commons Attribution License, which permits unrestricted use, distribution, and reproduction in any medium, provided the original work is properly cited. Serratia marcescens has been recognized as an important cause of nosocomial and community-acquired infections. To our knowledge, we describe the first case of S. marcescens rhabdomyolysis, most probably related to acute cholecystitis and secondary bacteremia. The condition was successfully managed with levofloxacin. Keeping in mind the relevant morbidity and mortality associated with bacterial rhabdomyolysis, physicians should consider this possibility in patients with suspected or proven bacterial disease. We suggest S. marcescens should be regarded as a new causative agent of infectious rhabdomyolysis. Serratia marcescens has been recognized as an important cause of nosocomial and, at a lesser extent, communityacquired infections . This pathogen is capable of producing a broad spectrum of human disease, including wound infections, pneumonia, meningitis, ocular and urinary tract infections, bacteremia, and endocarditis . 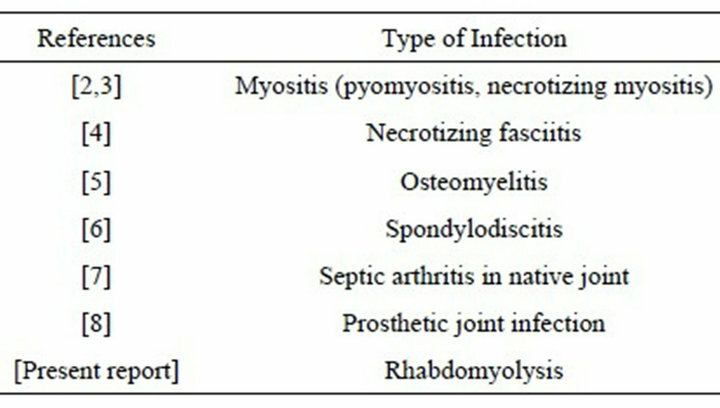 Besides, some musculoskeletal and joint syndromes have been attributed to it, bone and articular infections being the most frequent of them (Table 1) [2-8]. To our knowledge, we describe herein the first case of rhabdomyolysis due to S. marcescens. Table 1. Musculoskeletal and articular involvement in Serratia marcescens disease. eral, scarce rhonchi and rales. Interestingly, there were no findings indicative of acute arterial occlusion or compartment syndrome. Laboratory studies disclosed the following significant data: BUN 24.7 mg/dL; creatinine, 0.71 mg/dL; WBCs, 18,800/μL (17,400 polymorphonuclear neutrophils); normal hemoglobin, hematocrit, and platelet count; CPK, 3,627 U/L (normal level, 33 - 185); troponin T, 184 ng/L (<14); lactate dehydrogenase, 800 U/L; aspartate aminotransferase, 198; alanine aminotransferase, 213 U/L; alkaline phosphatase, 138; gammaglutamyltransferase, 555 U/L; C-reactive protein, 6.57 mg/dL (<0.5); normal INR and partial thromboplastin time. The urine was positive for proteins but the presence of myoglobin was not assessed. Chest radiograph showed normal findings and an electrocardiogram revealed sinus tachycardia. Abdominal ultrasonography displayed multiple cholelithiasis with slight gallbladder enlargement. Echocardiogram and cardiac magnetic resonance imaging were unremarkable. Serologic studies were negative for HIV, HAV, HBV, HCV, Epstein-Barr virus, varicellazoster virus, herpes simplex virus, cytomegalovirus, Legionella pneumophila, Mycoplasma pneumoniae, and Coxiella burnetii. PCR analysis for influenza virus type A and B from two nasopharyngeal swab specimens was also negative. Blood and urine samples were obtained for culture in the emergency room and therapy with intravenous levofloxacin (500 mg twice a day for two days, then 500 mg daily) was started. On the second hospital day, serum CK and troponin T level raised to 6,476 U/L and 60 ng/L, respectively. Blood cultures (two bottles on day 2) became positive for S. marcescens, which was sensitive to quinolones. The urine culture showed no growth. He became apyretic within 48 hours and the rest of the hospital course was uneventful. When the patient was discharged asymptomatic 8 days after admission, his serum CK concentration had decreased to 228 U/L. At a follow-up visit 1 month after discharge, he remained well and laboratory studies (including CK and troponin T values, liver function tests, and convalescent serologic assessment) revealed normal results. At a second follow-up evaluation 6 months after discharge, he went on symptoms free. Our patient developed S. marcescens bacteremia and rhabdomyolysis, most probably related to acute cholecystitis. Rhabdomyolysis has been associated with multiple etiologic agents, including viral and bacterial infections [9,10]. It should be distinguished from pyomyositis and myonecrosis in that there is no evidence of abscesses or localized site of muscle lesion . Among bacteria, Legionella species, Streptococcus species, Francisella tularensis, and Salmonella species are the most commonly identified causes. Although the underlying mechanism for rhabdomyolysis by S. marcescens is unknown, toxin generation and/or direct bacterial invasion of skeletal muscle could be implicated. Keeping in mind the relevant morbidity (acute renal failure in 57% of patients) and mortality (death in 38% of cases) associated with bacterial rhabdomyolysis , physicians should consider this possibility in patients with suspected or proven bacterial disease. We suggest S. marcescens should be regarded as a new causative agent of infectious rhabdomyolysis. S. S. Mahmoud, S. Odak, Z. Qazzafi and M. J. McNicholas, “Primary Total Knee Arthroplasty Infected with Serratia marcescens,” BMJ Case Reports, 2012.